Q: How does it feel to be the first to make it to the round of 16? A: I never expected to be the first to make it to the round of 16. I thought today's games would have been really tough, and I am very happy to be able to come in first in my group and advance into the round of 16. I didn't have much time to practise or analyse my opponents, and focused mainly on preparing my fundamentals. I am satisfied with the good results today. Q: There was a really long break before this GSL. How did you pass this time? Is it very stressful being the defending champion? A: I don't really feel any pressure. I guess I was able to play like I did today because my mind was at ease. During the rest period I also played in WCS, and I also played in the foreign team league, so there wasn't too much worries about my current form. Q: The first set was a difficult 2-1 win. A: Suhosin played really well. His attack was totally different from what I had expected, and it really baffled me. I thought Suhosin did not really have a good practice environment, and that it would be an easier game against him, so I picked him during the nominations. But he played really well, and I wasn't too happy with how the games went, but I'm still glad I won. Q: In the games versus Parting, both of you took turns using all-ins on each other. A: The all-in for the first game was deliberate. Not only have I never done it against Parting, I've never even used the strategy against any other Protoss. If Parting had watched my previous games, I believe he would have ruled out any possibility that I would all-in. For the second game, I thought he would play a more macro style, so I chose to produce colossi. But when I saw my opponent's dark templar, I made a really serious mistake and cancelled my colossus. I think I could have held it if I continued colossus production, but I was too panicked then. Q: With today's win, you managed to avenge your 0-2 defeat to Parting in WCS. A: I didn't think too much about it. Parting's a really strong player, so it was normal to lose to him. I didn't think too much about whether I would win or lose today's games, I just wanted to play to the best of my abilities. Q: Did you have another agreement with Parting not to do any ceremonies today? A: Yes we did. I'm quite sorry towards Gomtv and the reporters because of this, but we already had the agreement not to do the ceremonies. I plan to continue keepomg this agreement with Parting. I want to maintain good relationships with him. The impact is really severe every time he does a ceremony. Somehow, his ceremonies are really good and offensive (laughs). Q: Who do you want to face in the round of 16? Any thoughts about playing against Kespa players? A: I want to play against a Terran or a Zerg. But the Zerg players are really strong recently, so my first choice is still to play against a Terran. I hope that if it's a Zerg, it'd be a Zerg who doesn't like to play in the mid-late game, and if it's a Terran, it'd be a Terran who only likes to play macro games. If it's possible, I want to play against Jaedong. Q: What's your aim this season? A: Being defending champion, I hope that I'd still be able to get the picking rights during the group nominations for next season. For now I'll be working hard to help the team to win, and this requires more practice. These are the two goals I have in mind. A: The schedule was really tight for taking part in Code S this season. Hopefully it'll be looser for next season. I understand that there's only like a two day gap between the tournament and the small group stages [T/N: Not sure what he's referring to. Maybe Up and Down matches? ], and it's really tiring. But I'm still really happy and grateful to be able to advance to the round of 16. I want to thank the coach and his family and also my family and the players who practised with me. Finally, I also want to thank our sponsors, LG Electronics, Steel Series, Coca-Cola, Googims Company, Nvidia. Q: How does it feel to return to the Code S round of 16 after two seasons? 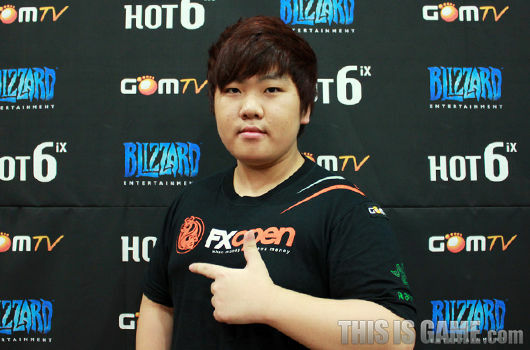 A: My results have been really bad in the GSL, and that made me really troubled. I previously mentioned I wanted to be able to produce some presentable results in GSL, and I'm very happy to advance to the round of 16 today. But I'm still not satisfied with my play now, and need to really work hard. Q: In the second set against Parting, he really made quite a comeback. A: For the second game, the spine crawlers should have been at the second base, but I built them at the third base, and that lead to the loss. In the third game, I really wanted to perform well, but I was too focused on trying to counter my opponent's strategy, and that had an adverse effect. Q: In the loser's games, you held your opponent's 10-pool consecutively. A: Recently, I am able to hold the typical 10-pool quite easily, but it's really hard to hold the 10-pool all-in with drones and all. I was able to hold the first game because it was not an all-in. In the second game, when he used the all-in, he seemed to be a bit uncertain with his all-in, and I was able to win easily because of that. Q: In the final meeting against Parting, you got your revenge with a 2-0 win. A: I mentioned this in a MLG interview. I won't lose again against a player that I had just lost to, with the exception of MarineKing. Against other players, if I lost, I would be able to get the win in the next match against them. Q: Your form in winning MLG seems to have lasted until now. A: It was really tough today to advance, and that makes me a little worried. But now that I am in the round of 16, I guess you could say that the winning form is still there. Q: Both your MLG wins were from the open bracket. A: I think that I'd play badly in a situation where there isn't much pressure on me. I seem to be able to play well if I keep playing on the edge. A certain amount of moderate pressure really helps me play better, and also allows me to concentrate better in the games. Q: Recently, Zergs have been saying it's difficult for them to play. What are your thoughts about this? A: To be honest, there's still a fighting chance when it comes to ZvT but ZvP is really too hard. Protoss is really too strong. Even when we reach the ultimate army of infestor broodlord, Zergs are still not in a firm position to win. The tempo of the game is always in the hands of the Protoss, and that makes it really hard to play. The Protoss warp prism is really too strong. It's so hard to kill and moves so fast, and just seems to fly around ignoring the corruptors. 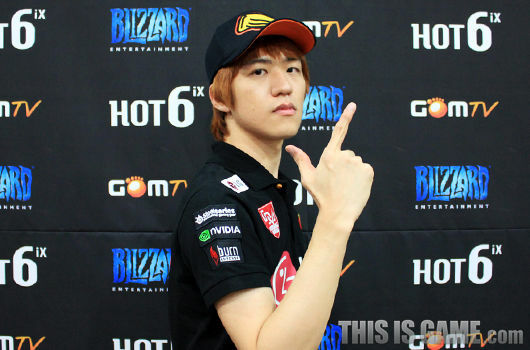 Q: What's your aim in GSL Code S this season? A: Since I won at MLG, I hope to also be able to win in GSL Code S. I would like to win a GSL trophy. Q: Who'd be your greatest stumbling block along the way to victory? A: I am very weak in my mirror match up, so I feel that if I'm able to avoid the Zergs I should be able to produce good results. Q: If you were able to choose who'd you choose for your round of 16 opponent? A: I want to choose Rain. I want to get my revenge soon. I will take the chance to avenge my loss in WCS. A: I want to thank the fans for cheering for me. Also want to thank the sponsors, FXO, Razer, Gomtv. Showmatch for king of translation gogogogo. "Even when we reach the ultimate army of infestor broodlord, it's still not really a definite victory for Zerg"
Erm, isn't this a good thing? I don't mind you post and we can get the mods to scrape this one haha. I think yours are better since it's Korean - English. The Protoss warp prism is really too strong. It's so hard to kill and moves so fast, and just seems to fly around ignoring the corruptors. THESE MISTAKES ARE NOT ACCEPTABLE IN THE WORLD OF TRANSLATION IT'S DOG EATS DOG HERE SUCH WEAKNESSES MUST NOT HAPPEN. Thanks for the interviews Weirdkid. It's nice to know we have backup translators here in this site. Thanks to our translator heroes! I feel really bad for David Kim. He is trying to solve a Puzzle with changing shapes.